Migration Barriers Barriers to inland wetland migration, such as this Dutch dike, are common in Europe and China. © Rijkswaterstaat/Joop Van Houdt. 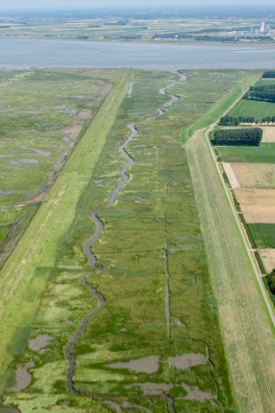 Dike Barrier Dikes like this one in Belgium act as barriers to the inland migration of coastal wetlands. © Rijkswaterstaat/Joop Van Houdt. 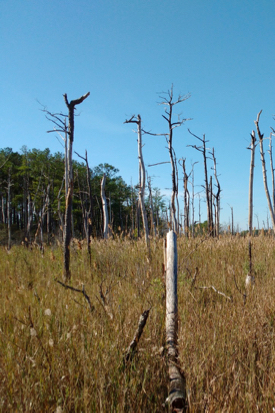 Ghost Forests “Ghost forests,” now common in Chesapeake Bay and along the Gulf Coast, are evidence of the landward migration of saltmarshes. © M. Kirwan/VIMS. When Florence slogged ashore in North Carolina last week, coastal wetlands offered one of the best lines of defense against the hurricane’s waves and surge. The study, published in Nature the day before Florence made landfall, addressed a major uncertainty in how saltmarshes and mangroves will respond to sea-level rise. It was authored by an international research team with members in the U.K., U.S., Belgium, Germany, and Australia. Associate Professor Matt Kirwan of the Virginia Institute of Marine Science was the sole U.S.-based contributor. 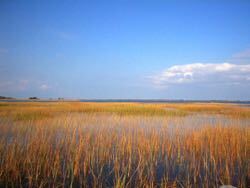 The study was motivated by a history of conflicting predictions concerning the fate of coastal wetlands in a warming world. In their Nature study, the researchers integrated the previously independent approaches, using a novel modelling method that combined global simulations of sea-level rise, population growth, and other factors with localized measurements and simulations of saltmarsh accretion. Their results counter previous estimates of global coastal-wetland loss—up to 90% in some studies—instead predicting that wetland area could actually increase as sea level rises. 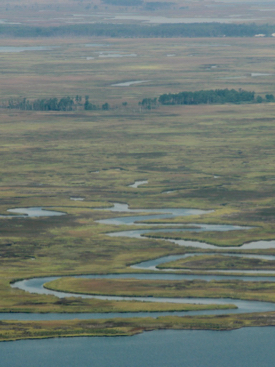 Indeed, the researchers estimate gains of up to 60% in coastal wetland acreage, but with two important caveats—the capacity for marshes to migrate inland sans seawalls or dikes, and no decrease in sediment supply. The researchers used human population density to gauge the likelihood that a coastal area is protected by the kind of infrastructure that would block wetland migration, and found a key threshold at 20 people per square kilometer. Building coastal-protection measures in areas with lower population densities will lead to global marsh loss, while reserving coastal-protection measures for areas with higher densities will lead to marsh gain. The 20-person threshold applies under all tested scenarios of sea-level rise and population growth out to the year 2100. Explains Kirwan, “If dikes are built to protect areas with lower population densities, say 5 people per square kilometer, then much of the coast will be diked and marshes will have nowhere to go.” Under such a scenario, the Nature study shows a 30% loss of coastal wetlands as seas rise to the highest projected 2100 levels. The study’s most optimistic, 60% prediction of wetland gain occurs under a much greater, 300-person-km2 threshold scenario, essentially allowing coastal wetlands to migrate inland unimpeded until they are lapping at urban shores. A simulation at the 20-person threshold predicts a global wetland gain of 37%. In an interesting twist, the 20-person threshold happens to be the current global average population density above which coastal communities are protected by some kind of infrastructure. Thus, for coastal wetlands to expand in the face of projected increases in both sea-level rise and human population, accommodation space must be not only preserved but expanded. Kirwan stresses that the Nature study reveals several important differences between coastal wetlands and their projected fates in different parts of the world. Kirwan notes the Nature study also predicts that regional differences in the fate of saltmarshes will be influenced by differences in sediment availability, helping to explain what at first might seem a paradox.